The platypus has been held responsible for sailors believing in the existence of a half-woman, half-fish creature, better known as a mermaid. One glance at this semiaquatic creature with a duck-shaped mouth, beaver tail, stubby webbed feet and fur like a mole and it's hard to believe that the sailors weren't drunk. 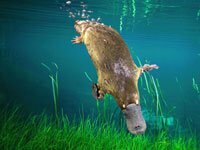 Swimming in the waters off the coasts of Australia and Tasmania, the strange, disconnected body parts of the platypus seem to make sense. The plum-colored fur with a texture amazingly like that of a mole is waterproof, and the duck-like bill is sensitive to touch and to the electrical signals generated from its aquatic prey. 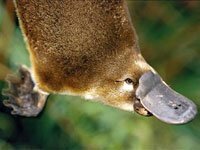 The platypus is a voracious eater, hunting for an average of 12 hours a day. It feeds on annelid worms, insect larvae, freshwater shrimp and yabbies. It catches its prey while swimming and by digging into the riverbed with its bill. It stores its prey in cheek pouches and eats only after surfacing. A semi-aquatic animal, it inhabits streams and rivers across a wide range of habitats. Its webbed front feet propel this excellent swimmer forward, while its webbed hind feet and tail help to steer. When not hunting, it rests in a short, straight burrow along the riverbank. These Australian mammals are bottom feeders. They scoop up insects and larvae, shellfish, and worms in their bill along with bits of gravel and mud from the bottom. All this material is stored in cheek pouches and, at the surface, mashed for consumption. 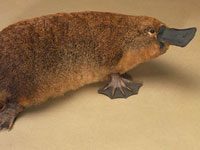 Platypuses do not have teeth, so the bits of gravel help them to "chew" their meal. The platypus will lay one to two eggs each season. The incubation period for the leathery-shelled eggs is quick. After only a month of gestation and 10 days of keeping the new eggs warm, the tiny platypuses emerge from their shells. In a burrow the mother will take care of the young for three to four months, at times leaving them alone for as long as 38 hours while she searches for food. Did you know this about the platypus? 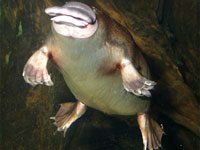 The male platypus has a spur on its heel capable of delvering a cocktail of venom. The platypus is one of the few venomous mammals. The platypus uses its two front feet to propel itself forward in a unique, alternate rowing motion. Its hind feet, also webbed, are held against the body and — along with the tail — are used for steering. Download free Platypus wallpapers, click on the image to open the large version. Print free Platypus coloring pages, click on the image to open the large version.